DogsBite.org - Today marks the 10th Anniversary of DogsBite.org. We recall quite vividly when we reached the five year mark as well. At that time the founder was in Tucson delivering a speech to the first ever grassroots event for dog attack survivors, Walk for Victims of Pit Bulls and Other Dangerous Dogs. "They say it takes 5 years for a movement to take flight," Colleen Lynn told the audience back then. "That moment of flight is right here and now, right here at this event." 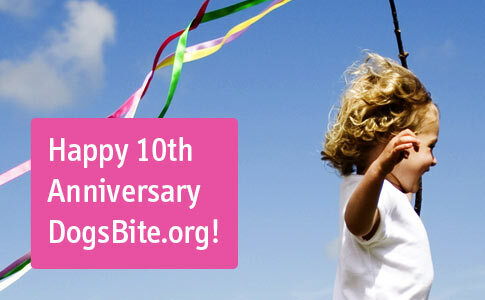 10 years later, DogsBite.org is living proof that some ideas take flight on their own. They are bigger than any one person or a thousand persons combined. The pit bull problem leaves victims in its path across America and has been for over 30-years. A growing body of research now shows that pit bull injuries have a higher prevalence in level 1 trauma centers than all other dog breeds. 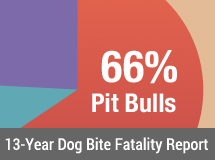 The majority of these studies also show that pit bulls are inflicting a higher severity of injury. Let there be no doubt that our high authority website has attracted the interest of medical researchers. 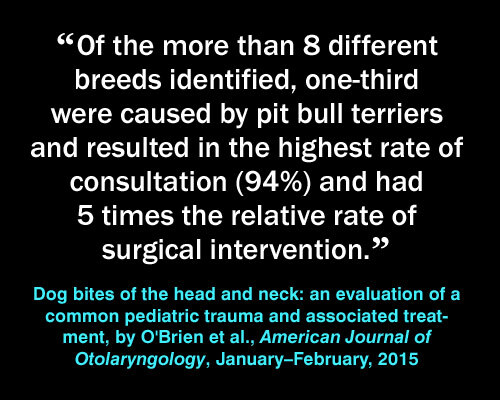 In April 2011, the Annals of Surgery published a study about severe and fatal injuries inflicted by pit bulls. "Mortality, Mauling, and Maiming by Vicious Dogs," examined the medical records of patients admitted to the level I trauma center of San Antonio University Hospital with dog bite injuries over a 15-year period. The results bore the grim reality of severe pit bull injuries. Since that time, a group of peer-reviewed medical studies from level 1 trauma centers have confirmed these results. As we stated in our end-of-year letter last year to donors, "The role of DogsBite is always to 'keep shining the light' on this issue. The reach and growth of our advocacy website since 2011 has been remarkable. Our website reinforces to doctors and researchers that this is a serious societal problem, so much so that entire nonprofits are being built around it." We also shared with donors: "You are now part of something so big that no one can see how this landscape will appear five years from now after many pediatricians and nurses in family practices tell parents to keep their kids away from pit bulls -- from any interactions with pit bulls," states the letter. "Prevention starts in the pediatrician’s office! Right then and there parents will be told the truth about pit bull injuries from a medical professional." These dogs are not worth the risk! On the legislative front, we have climbed hurdles so steep, only Olympic athletes could compete. We did not get involved in the state preemption law battle, which bars cities and counties from enacting breed-specific laws and is primarily funded by a multi-million dollar fighting dog advocacy group, until 2014. Since January 2012, state legislators have rejected 77% of these preemption bills. Over the last 2.5 years, Jan. 2015 to June 2017, the rejection rate increased to 90%. Lacking market share does not equate to lacking credibility. The highest court in Maryland validated our credibility in 2012; before that, so had the Mortality, Mauling, and Maiming by Vicious Dogs study, which cited parts of our statistical data. What is true is that DogsBite.org is a principal source of information on the matter of serious and fatal dog bite injuries that is not owned, controlled, or funded by dog breeders, dog advocacy, veterinarian or animal welfare groups. Today, its not just walkers, joggers, children, grandparents and pets that experience vicious attacks by dogs, it's people on airplanes too. Excessive service dog fraud, particularly by pit bull owners, is rampant today. We knew in 2010, when the new ADA guidelines with gaping loopholes went into effect, there would be serious repercussions. Of course the most deviant types of dog owners would take advantage of these loopholes, especially to evade local pit bull ordinances. In 2012, a 23-year old "dog rescuer" named Rebecca Carey was mauled to death by her own rescue dogs in Georgia, marking one of the first high profile rescue dog fatalities in our data set. We later had to revamp the parameters we collect for dog bite fatalities to include, "Was the involved dog a 'rescue' or 'rehomed' dog?" Since 2012, rescue and rehomed dogs have killed at least 21 people, 71% (15) were vetted by a rescue or shelter before being adopted out. Other negative trends since 2012 include the many shelters across the country that are "dropping breed labels," deliberately lying to the public, in order to adopt out more pit bulls. Dog bite attorney Kenneth Phillips recently responded about Los Angeles considering the idea. "Not identifying the breed or giving the history of the dog constitutes fraud and concealment. A public official who suggests withholding information from citizens should be removed from office," Phillips said. Frankly, the public's trust in city and county shelters is already eroding due to these blatant deceptions. This is in addition to the growing number of aggressive dogs being adopted out under the guise of a third or fourth "rebranding." For instance, "Rainbow," who is allegedly a "ray of sunshine" but was returned by four separate owners. The "baby talk" by many of today's shelters is revolting, and when it is used to hide known aggression, criminal prosecutions are in order. 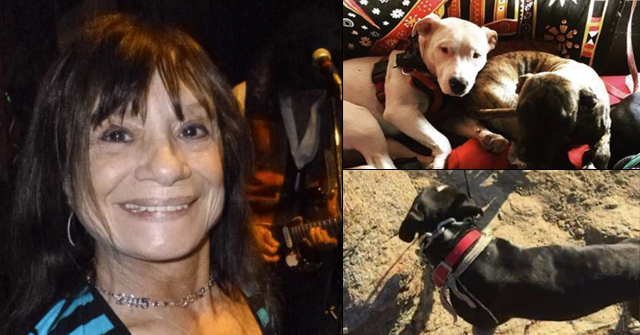 As we write this post, Pit Bulls and Parolees, is airing its 10th season. Yet, Tia Torres' organization, Villalobos Rescue Center, which pulls in over a million annually, has failed to file federal taxes for three consecutive years.1 Generally, the IRS automatically revokes a nonprofit organization's tax-exempt status when it fails to file three years in a row. We hope this season is her last one. When the show does fail to renew, it signals a waning interest by the public in pit bull adoptions. Yet, social media is a much more powerful vehicle to spread pit bull myths and misinformation than a TV show. That is where we are today on our 10th anniversary. There are thousands of photos floating around in social media of pit bulls lying with babies -- a direct violation of all "baby safety" and family dog rules. It's not only pit bull owners, who take and share these deadly propaganda photos, but members of the media are equally to blame when they air them. A reporter recently asked us if we had an "elevator pitch." We said no. Our mission is pretty simple: "We are a national dog bite victims' group dedicated to reducing serious dog attacks." 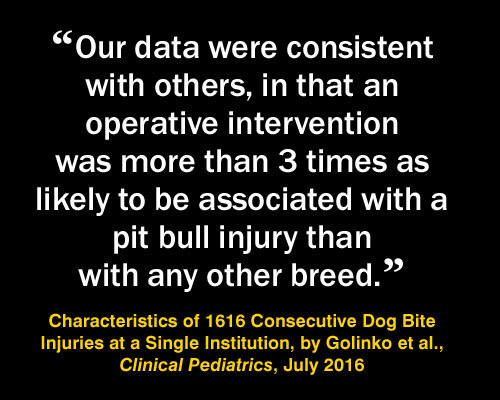 Peer-reviewed medical studies of level 1 trauma centers -- both pediatric and adult -- show that pit bulls are producing the most serious injuries. These are the kinds of injuries we are trying to prevent. The most powerful way to prevent them is to provide honest information to the public. At some point in the future, the dangerousness of the pit bull breed will become more broadly realized. Social media works in two ways -- the purveyors spreading misinformation and the readers who understand it for what it actually is: deceptive propaganda and personal attacks. At some point down the road, it will also be true in many communities that a majority of its members will have been directly or indirectly (by knowing someone who has) impacted by pit bull violence. On April 26, 2012, sunlight soared across America. It began with a phone call by Tony Solesky. He told the founder on that morning, "Colleen, I think something happened today." It was the day the highest court in Maryland issued the landmark ruling, Tracey v. Solesky. The Court's ruling, of which we supplied the winning amicus brief, remains the seminal ruling declaring pit bulls "inherently dangerous," despite a heavily lobbied legislative body scaling it back two years later. The brilliant articulation from the Court is summed up in the first paragraph, which points out a century old case of a 10-year old Maryland boy nearly killed by a pit bull. 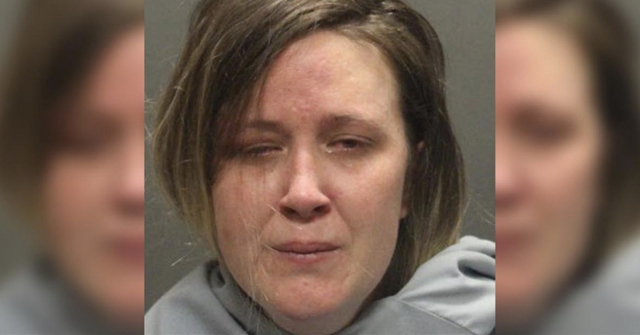 "The pit bull refused to release the boy until a witness picked up a 'scantling' and struck the dog, killing it," wrote the Court. 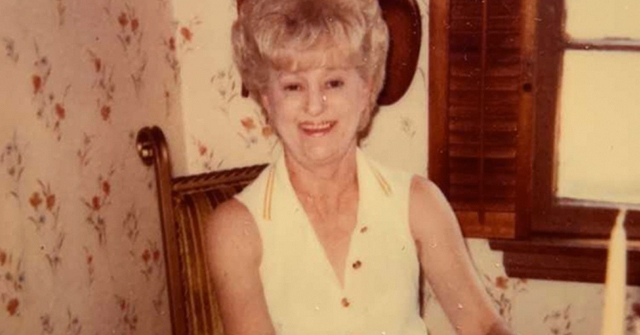 They also provided his mother's testimony, who described her child: "[H]e was unconscious, in such a condition that she did not know whether he was living or dead … Blood all over him." Public health battles are often fought over many decades. As a society, we eventually come to accept the dangerousness of certain products and habits when we can no longer deny the research and data that proves this point or when policies ban it. The pit bull problem is indeed an adult “habit,” but children are paying the highest price. That is unacceptable and why our advocacy will eventuallly prevail. Currently, over 30 countries ban the importation of this dog breed. On this day of October 15, 2017, ten years after we started this journey, the founder of DogsBite.org, Colleen Lynn, will be in Seattle, Washington, where this journey suddenly began. When the universal prayer of all victims of violent dog attacks moved her -- like it has many victims before her. "Please God, this cannot ever happen to someone else," is the steadfast belief that drives our mission at DogsBite.org. We know that our devoted readers share this same belief. To honor the 10th year anniversary of DogsBite, a small nonprofit that delivers the benchmark in U.S. dog bite fatality statistics annually, because the U.S. government stopped in 2000, we ask that you download images from our Injury Statistics meme campaign showing quotes from recent medical studies confirming, "Our data were consistent with others, in that an operative intervention was more than 3 times as likely to be associated with a pit bull injury than with any other breed." 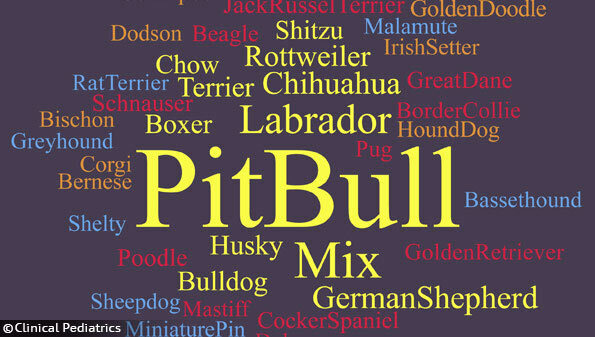 Use them on social media to dispel the pit bull myth purveyors! Spread them far and wide! On October 15, 2017 the founder will be with Ona Deane-Gordly, one of the most powerful pit bull attack victims we have ever had the grace of knowing. Thank you for your support! 1The statement by Charity Navigator, claiming Villalobos Rescue Center is not eligible to be rated, is invalid. The last 990 on record for the organization from December 2013 states $1.6 million in revenue. Congratulations, Colleen! You are indeed a shining light. I come here not only for information, but to be refreshed by your sane voice in a world that seems to have gone mad. Thank you for all of your hard work. Thank you Colleen. Your work is so important to so many people. Note how the Pima County, Arizona animal shelter is mentioned in this post. And not in a good way. I have personally witnessed the shelter director in the act of pit bull pushing. If there is a serious injury or fatality because of this misguided policy, we, the taxpayers of Pima County will pay a high price. I remember when I first encountered Dogsbite.org. I had been thoroughly brainwashed by the pit bull propaganda, and I didn't want to believe it at first. I shrugged it off. But something made me keep visiting the site, and reading the blog back to the very beginning. I realized I wasn't too proud to admit that I had been wrong. Packhorse – same kind of story for me. I used to believe training could make any dog into a reliable pet when I got my first dog (border collie). Plus I had heard all the pitbull memes repeated so often that I had started to believe them. I never had any interest in owning a pit (or a fighting breed) but I knew people that did own them with (seemingly) no problems and these people pushed the pitbull propaganda hard (especially the nanny dog thing). After having experienced several failings of training / socialization (some with my own dog and some from others' dogs) I started to realize that breed traits are a large part of the equation. Neither nature nor nurture alone can be fully responsible for behaviour, in ANY species (yes, that includes humans) – it is always a mix of both. It wasn't long after I had this realisation that I sought more information about pit bulls and dog attacks and came across dogsbite. I definitely agree with the previous commenters, especially Lucu Lencia's great statement about genetic dog traits. That used to be common knowledge and commonly-accepted. A bit of my own background: I grew up with dogs of various breeds (never bully breeds!) and trained and showed one of our dogs in 4-H during the late 90s. Pit bulls weren't that popular then. I always used to scoff at what I thought was the irrational fear and over-dramatic reaction my mom had to pit bulls. I've known several sweet ones over the years. But I've also learned a lot about the dog industry, including the unfortunate lies about dog training (learned that the hard way), and in the last year or so I stumbled across some pit bull information on Pinterest, of all places. That led to extensive research and the opening of my eyes. Thank God no one in my family–human or animal alike–have ever been a victim of a pit bull. I'm thankful to be armed with this knowledge and will do my part to spread the word and protect those I love. Thank you, Colleen, for the hard and important work you're doing and your journalistic integrity–it's so refreshing to see facts and logic in action, not just emotions or histrionics. Though the pit advocates may claim we're all just a bunch of haters and not seeking truth, they are the ones who are blinded and overcome by feelings and bias. Happy Anniversary DBO! There are no words to explain how important your work is and how much it's appreciated! Your rational, fact based website is like the eye of the storm in the hurricane of pit bull insanity. You're saving lives everyday by telling the truth about a creature that has been bred for decades for one purpose – to kill. You stay strong and resolute even when the cruel, vulgar, depraved pit bull fanatics are engaging in the typical disgusting behavior. DBO is like that friend you can talk to who just gets it. There are children, pets, and other loved ones who are safer today because of all the hard work you do. Thank you, thank you, thank you! Colleen, although I'm sorry for what happened to you, I'm glad you started DBO. Your own attack may have been the very thing that prevented other attacks from happening. You're a warrior. Never give up, stay strong, and know we're all behind you. 10 years is a long time. It was excellent to be back in Seattle for the anniversary. Thank you so much for being such devoted followers and commenters on our blog. It's so important that readers can see comments from the experienced ones. Thank you!!!!! To 10 years and beyond! I live not far from Gainesville, Fla. If you've been following the news I'm sure you've heard of the visit we had from a man who has come to represent hate and bigotry in this country. While I know that not all pit bull defenders are racists (to turn their own argument against them they are "racists" because of the entitlement they feel that their breed deserves and their disregard for the lives of others, animal and human), I can't help but draw a parallel between the two groups and their beliefs. The pit defenders loudly and aggressively lobby for their "rights" while denying others the right to live a peaceful life without violence and fear. I'm proud of my community. It's my hope that one day people will come to their senses on this issue of dangerous dogs and throw the bums out in a like manner. Everything you've accomplished, Colleen, is a glimmer on the horizon, leading us on.